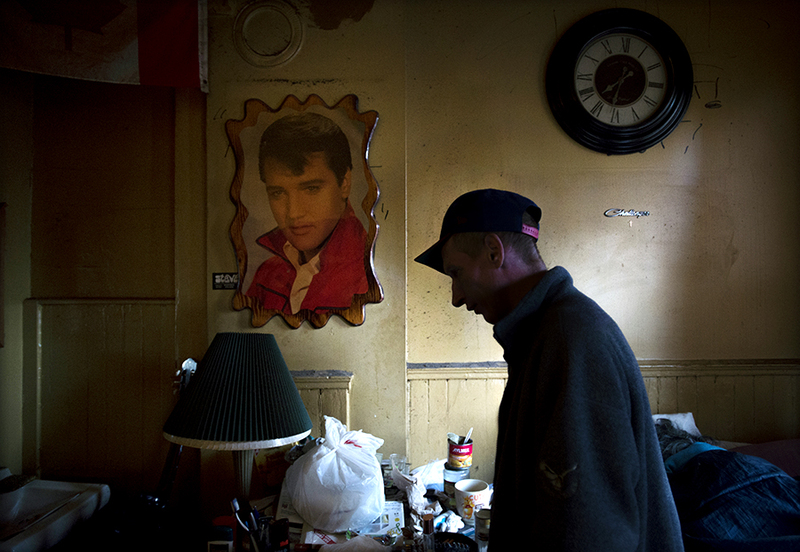 A 5-year resident of The Palace Arms is silhouetted while in his room at the rooming house in Toronto. A few months ago, I was asked to try and make acquaintances with residents of The Palace Arms in hopes of getting a glimpse of life inside the dilapidated rooming house before it goes up for sale. My first attempt ended as I had anticipated – I was yelled at and kicked off the premises, but I went back a second time and had the good fortune of meeting an incredibly nice man who was more than generous with his time. I was invited into the gentleman’s room which has been his home for over 5 years. The man was reluctant to have his portrait taken and didn’t want his name used, but he agreed to be silhouetted and make the picture more about the space – I was happy to focus on the portrait of The King.